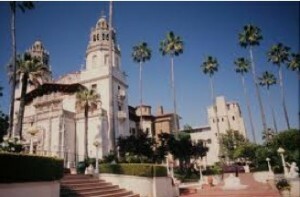 San Simeon is on the Pacific coast of San Luis Obispo County, California. A key feature of the area is Hearst Castle, a hilltop mansion built by William Randolph Hearst in the early 20th century that is now a tourist attraction. The area is also known for a large elephant seal population.